Whether you are aware of the increasing buzz about global catastrophe/transformation related to 2012 and Mayan prophecies or not, it is clear that the world has already entered a frightening “transition state” globally and that the old vessels are not holding in the face of such an earthquake of change. If we are awake as MKP leaders we must engage the task of understanding what is happening and asking serious questions about our role and the mission of the global MKP community in fielding creative responses. 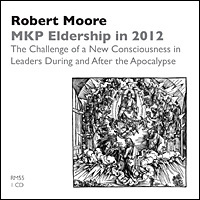 In the address and the discussion that follows, Robert Moore reflects on some of the dynamics underlying this crisis/opportunity and on the role of Communities of Initiation and Generativity in birthing a new personal, social and spiritual ethos for the next decade and beyond. This program is the keynote address at the 2011 USA Gathering of Elders at the Wesley Woods Camp and Retreat Center outside Indianola, Iowa. Dr. Moore’s second presentation at the Gathering.